Cradle Mountain - Lake St. Clair National Park is a wilderness World Heritage Area where you will find crystal clean air, wild rivers, waterfalls, unique flora and wildlife. Explore the jagged contours of Cradle Mountain. Experience true isolation, peace and tranquility on one of Cradle Mountain's many wilderness walks. Walks vary from interpretive boardwalks to challenging mountain climbs requiring overnight stays. Unwind and discover the beauty of Tasmania's wilderness through the eyes of Tasmania's and the world's finest photographers at the Wilderness Gallery. Why not indulge yourself by taking a flight with Cradle Mountain Helicopters to capture a bird's eye view of Tasmania's most famous World Heritage Areas. Indulge and pamper yourself with one of the many signature treatments available at the Waldheim Alpine Spa, Cradle Mountain Lodge. Waldheim Alpine Spa specialises in locally sourced natural therapy products, reflecting the natural purity and pristine beauty of the Tasmanian Wilderness. The Calm Day Spa at Cradle Mountain Chateau also offers spas, facials and soothing massages with certified organic products to rejuvenate yourself after a day in the wilderness. At the end of an eventful day, relax in the comfort and luxury of one of Cradle Mountain's many accommodation providers and experience a true Tasmanian food and wine experience set amidst the natural beauty of the Tasmanian wilderness. Icy streams cascading out of rugged mountains, ancient pines mirrored in the still waters of glacial lakes and a wealth of wildlife ensure there is always something to captivate the senses. Cradle Mountain is the starting point for the world-famous Overland Track, a magnificent 6 day walk that will take you through the heart of some of Tasmania's finest mountain terrain. Cradle Mountain is a 'must see' Tasmanian destination if escaping the hustle and bustle of life and appreciate nature at its most pristine. The months of December - April have long daylight hours and warmer average temperatures. These months are recommended to walkers inexperienced in Tasmanian conditions. However, walkers are warned that rapidly changing weather conditions can occur at any time of the year. These can include howling winds, sleet, snow, relentless rain and blazing sun. All of these varied conditions can be experienced within a single day. It is recommended that you obtain the latest weather forecast before setting out. These are available online from the Bureau of Meteorology. Bookings are required for each walking season (1 November to 30 April) - see www.overlandtrack.com.au for details and to make a booking. During the booking period walkers will be required to walk the track from North to South (Cradle Mountain to Lake St Clair), and pay the Overland Track Fee. If your departure date is outside the booking period, this won’t apply to you. * A valid Tasmanian National Park Pass is required for entry into the Cradle Mountain - Lake St Clair National Park. If you book on at short notice (i.e. less than 2 weeks before departure) you will find you have a limited choice of departure dates, especially from December – February when many people have holidays. During April, large numbers of walkers come specifically to watch the changing colours of the deciduous beech (fagus). Walheim Cabins bushwalker accommodation can be booked on www.sheffieldcradleinfo.com.au or call the Kentish Visitor Information Centre 03 6491 1036. 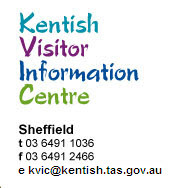 Email kvic@kentish.tas.gov.au.